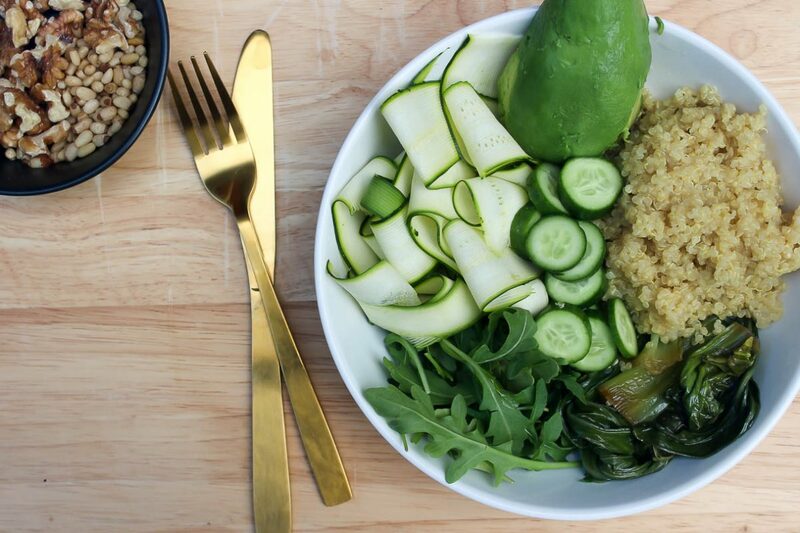 A super nourishing green bowl of goodness! It’s my current obsession and go to lunch. It literally takes less than 15mins to prepare and is super filling. Plus, you’re getting a massive veggie boost! I have added quite a few veggies as they have loads of amazing benefits and will keep that immune system strong as winter approaches. It’s no denying I am a massive foodie, I appreciate food so much more when I understand how it is helping my body or, of course inflaming my body. It’s true, you are what you eat! Every 35 days, your skin replaces itself. Your liver about a month. Your body makes new cells from the food you eat. So, what you eat every day literally becomes YOU! So, let’s look at some of these incredible ingredients and why you will want to incorporate them into your new lunch menu! Zucchini – Did you know Zucchini is classified as a fruit! It’s also very low in calories but gives you the feeling of being full due to its high fibre count, which means it’s a fantastic ingredient when trying to lose weight. I love adding it to some of my smoothies (instead of banana), as it gives a nice thick consistency without the calories! It’s also great source of Magnesium and Vitamin C.
Cucumber- How often in this change of seasons do you feel dehydrated? No matter how much water you drink, moisturizer you use, your skin is still flaky? If this is this the case it’s a good idea to increase hydrating foods, like Cucumber! They hydrate at the deepest cellular level and help reduce bloating. When exercising, a great drink is coconut water, cucumber and berries- it’s like a healthy Gatorade. Bokchoy- is known to deliver the highest levels of nutrients per calorie compared to other foods!! Massive win for this forgotten about ingredient. It is also known for its anti-inflammatory benefits. Rocket- is part of the cruciferous family, which are known to alkaline the body and help detoxify your system! They are so important to incorporate into your meals! Quinoa- aaaah quinoa, we all know it’s a ‘superfood’ but do you know why it has gained so much popularity? Well for one it is one of the most protein rich foods you can eat, as it contains all nine essential amino acids. It contains TWICE as much fibre as other grains, and is also a great source of magnesium and fibre. Avocado- as with any meal, I would always suggest you have some form of ‘good fats’, avo’s are a healthy source of Omega 6 fatty acids. They are super easy on your digestive system and can help heal your gut-lining if you have any gut-disorders. They are not only nourishing to your gut but they help calm your nervous system and… wait for it… reduce the appearance of dark circles under your eyes! Bone Broth- is fantastic to add to your meals, it’s a super powerful flavour enhancer. It soaks up all the nutrients from the vegetables, herbs and spices in a way that the body can easily digest. It is also a great collagen supplement, which gives you that beautiful glowing skin with less wrinkles! Along with Collagen, glutamine, glycine and proline, these bad boys assist in the healing of the gut and give you a super immune boost. I could honestly talk about all the benefits of bone broth, but I will save them for another day. Tamari – this is like Soy Sauce; however, it isn’t full of the junk and its gluten free! I chose these ingredients to give you a balanced meal, keep you full but feeling light and ensure it is jam packed full of nutrients! BOOM – I think I did pretty well to be honest. Something you might notice; is I haven’t added a dressing as such… this is because there is so much flavour coming from the bokchoy, the creaminess of the avocado and crunch from the pine nuts, you don’t need anything else! WINNING. Don’t add things you don’t need. Rinse quinoa, place into saucepan with 1 cup of bone broth, and bring to boil. Add ½ cup of water and allow to simmer on a low heat for 15 minutes or until all the water has absorbed then turn off the heat. Fluff with fork. Cut the end of the bokchoy stalks and rinse. On a low heat, add bokchoy to the frying pan along with sesame oil and tamari. Add dash of water, to create steaming affect. Place lid on and leave for 8minutes or until the bokchoy has wilted. Meanwhile, thinly slice zucchini or make zoodles. Thinly slice cucumber. Add both to bowl. Add ½ avocado and rocket to bowl. Add the bokchoy and quinoa to bowl with all ingredients and sprinkle with pine nuts and walnuts.